A few months back I had to pass on a pretty rare NOS Playchoice 10 kit for the Nintendo ‘Red Tent’ style Vs Dualsystem table units. Just recently what I’m pretty sure is the same kit resurfaced, without the common but expensive motherboard. Sniping that auction allowed me to acquire some very rare parts for the very reasonable sum of ~$72. That grab prompted me to drag one of my storage bins out from the depths of the garage and re-test something I’d set aside for quite a while. It’s a complete single-monitor Playchoice 10 kit for a cabaret cabinet that I acquired something like a decade ago when Arctic Music & Vending in Anchorage closed and had its assets auctioned off. I’d given it a try fairly recently, but thought it was a dud since I didn’t get any video. This time around I took a closer look at the monitor I was using to test it and realized one of the cables between boards on the chassis was disconnected. I reconnected it and the game came right up. Miiiiiight have felt a little dumb after that discovery. Went through and tested the cartridges I have, and found them all in fine shape. 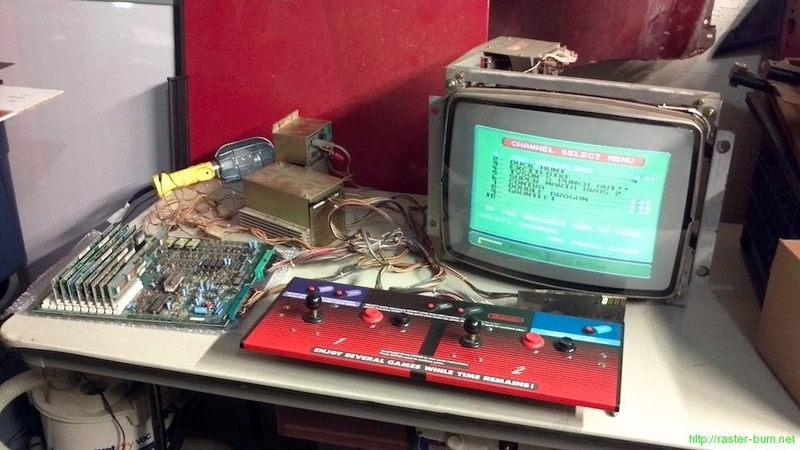 I came to figure out I have an older production motherboard, which means the Reset button on the control panel doesn’t function with the board set to free play mode. A little research revealed that you can hold the Channel Select and Enter buttons together for a few seconds and it’ll pop you back to the channel menu like the Reset button is supposed to. 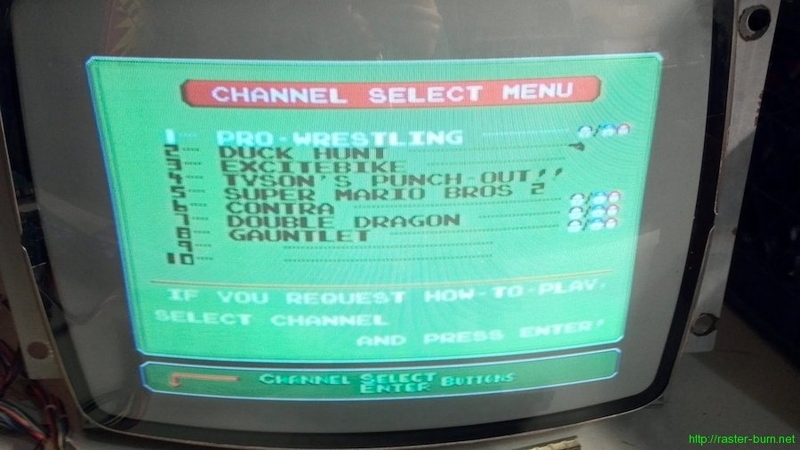 Not pictured on the menu are two more copies of Punch Out, and The Goonies. I also took the opportunity to test the Vs system board that came in my Red Tent, since the Playchoice 10 harness is close enough to the Vs one to at least boot a board on. Super Mario Bros came right up and played fine, but I wasn’t quite sure how to get to the other ‘side’ of the board with Dr. Mario. Unfortunately testing the monitors in the Red Tent didn’t go as well. One of them is blowing a fuse at F701 on power up, and the other seems to be working except for the light show that comes out of the flyback cage when you turn it on and the flyback transformer starts arcing. So, some repairs needed there. Also still need to dig into the R-Type upright cabinet I’ve got. It’s been sitting in a corner since I got it, supposedly it plays but I haven’t had the time to drag it out and see what’s going on with it. 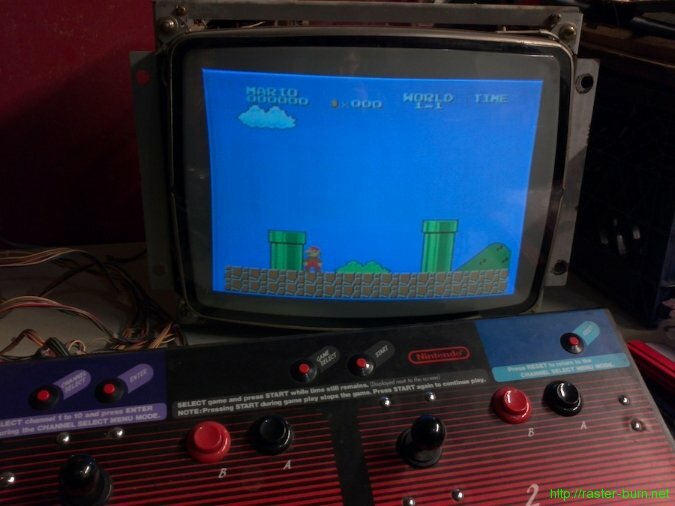 This entry was posted in Arcade, Portland and tagged Alaska, Anchorage, arcade, arctic music and vending, dr mario, dualsystem, nintendo, Oregon, playchoice 10, portland, red tent, super mario brothers, vs by Ken. Bookmark the permalink.